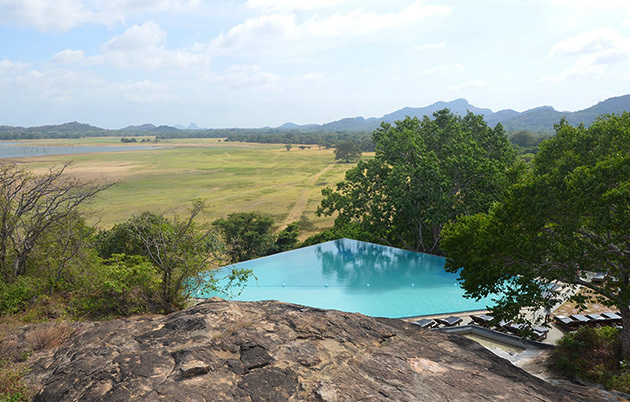 This resort is raised with great care in their integration into the unique landscape of Dambulla, an inner region of the island of Ceylon. 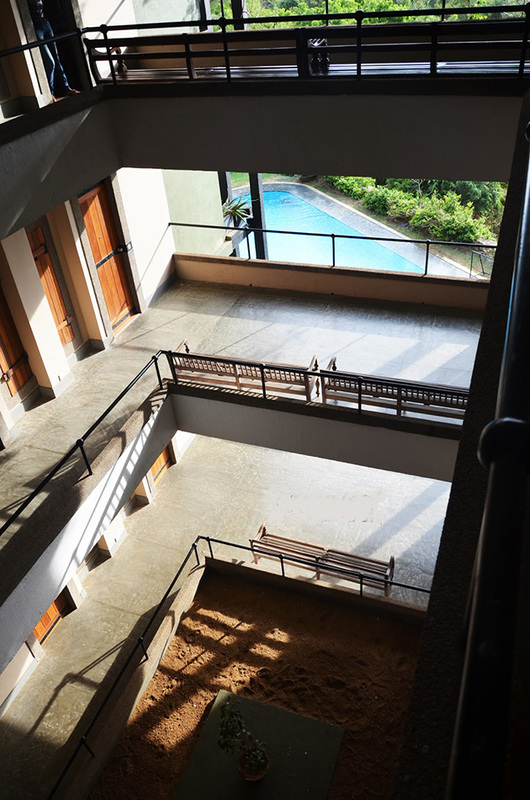 Was designed by Geoffrey Bawa between 1991 and 1995 to accommodate visitors to the nearby city of Sigiriya and Polonnaruwa monumental historical complex, performed over 700 years old. 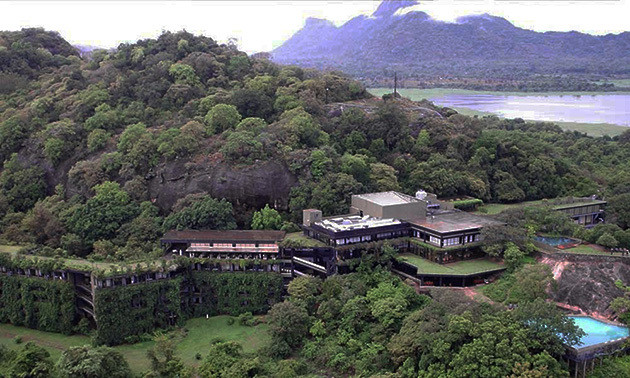 The Hotel Kandalama is a proposal somewhere between architecture and landscape. Against the initial approach of the promoter, place the building very close to the ruins of the historic city, the architect was able to convince him to install in another remote location that would not affect historic site. So, the proposed intervention is based on the occupation of a narrow strip of land around a large rocky hill located in key geographic position; allowing great views over the existing plain which inserts the Kandalama Lake. Thereby, visitors could enjoy the beautiful views of distant hills environment and water bodies, while preserving in its integrity the monument delicate subject of interest. Bawa installation poses as a journey of revelation which is to highlight the distant view of the citadel abandoned. 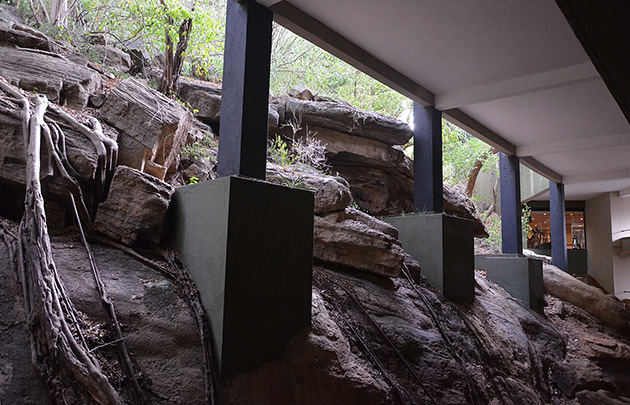 The set is accessed by a narrow road that ends in a porch for vehicles inserted into the rock. 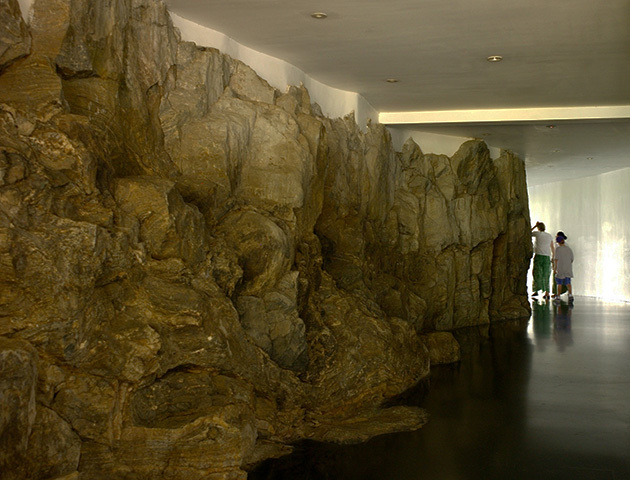 Visitors enter the hotel by a small covered walkway, a way tunnel, arcing snaking adapting to the ways of the rock and in front of which are placed the living spaces of the building. The volumes of several floors of rooms are set parallel to the polygonal line that establishes a connection main hall. 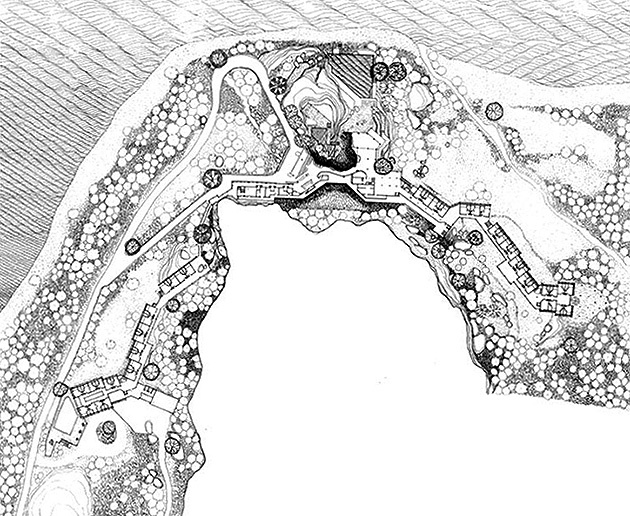 At the points of rotation of the ball and plant defined larger spaces allowing some expansion space and envision so distant landscape views. Finally, users access to the main areas estanciales and drawing room are located far different landscape views. The project takes into account the characteristic dry climate condition of the area. Because of this, the covers are presented as horizontal terraces that have good performance in the absence of heavy seasonal rains prevailing in other parts of the large island in the Indian Ocean. 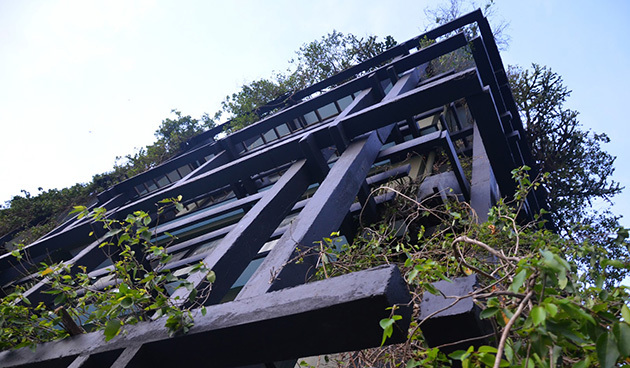 The building construction is conceived by use of reinforced concrete structures, whose pieces-beams, beams and slabs- are defined in the manner of a large network of black painted woodwork. The enclosure of the main facade involves large glazed panels facing the space in front of the rock. 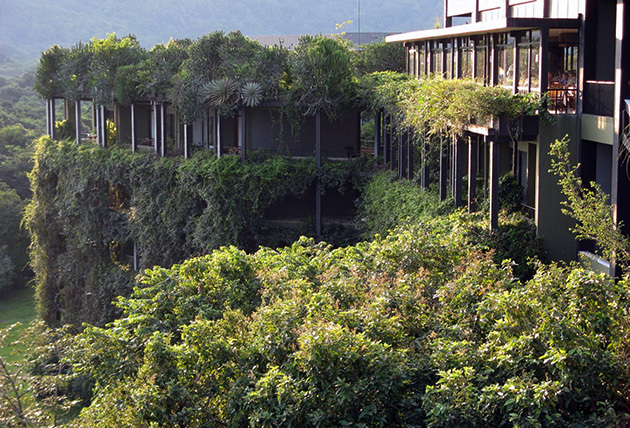 The most exposed part of the building is covered with vines and all kinds of plants, placed in planters hanging. The users feel inside is completely immersed in a virgin jungle. 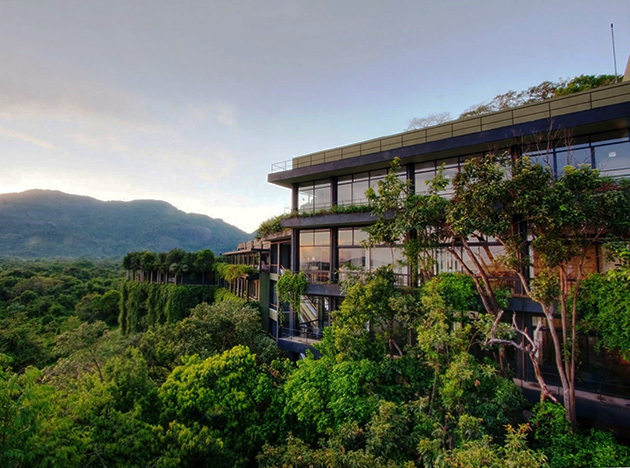 The architect achieved a visual integration and the building with its surrounding natural area. Interior designs pose numerous nods to local traditions, with a large presence of handicrafts, small sculptures, planters and water sources. The floors and numerous interior elements are made from wood, with preservation of the shapes and textures of the stone of the place where the building needed a scrupulously respected. Finally, terrace platforms and water bodies for different pools are strategically arranging outdoor enclosures in contact with the building. To finish complete the immersive effect, covers common areas are topped with small prairie grass, while the spaces reserved for the bathroom are placed strategically, getting rich visual relationships with nearby lake. 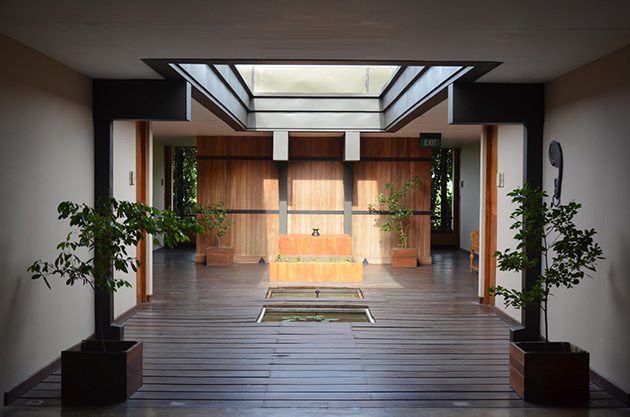 The Geoffrey Bawa Kandalama Hotel is a masterpiece of architecture that stands out for the simplicity of functional approach and the great wisdom of your landscape integration. A great example on how to fit tourist use on a pristine landscape, preserving the beauty of the place and cause negative environmental consequences.